The acceptance of new chemical ideas, before the Chemical Revolution of Lavoisier, in Greek-speaking communities in the 17th and 18th centuries did not create a discourse of chemical philosophy, as it did in Europe, but rather a “philosophy” of chemistry as it was formed through the evolution of didactic traditions of Chemistry. 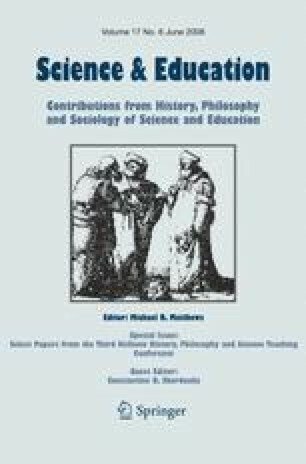 This “philosophical” chemistry was not based on the existence of any academic institutions, it was focused on the ontology of principles and forces governing the analysis/synthesis of matter and formulated two didactic traditions. The one, named “the system of chymists”, close to the Boylean/Cartesian tradition, accepted, contrary to Aristotelianism, the five “chymical” principles and also the analytical ideal, but the “chymical” principles were not under a conceptual and experimental investigation, as they were in Europe. Also, a crucial issue for this tradition remained the “mechanical” principles which were under the influence of the metaphysical nature of the Aristotelian principles. The other, close to the Boylean/Newtonian tradition, was the integrated presentation of the Newtonian “dream”, which maintained a discursive attitude with reference to the “chemical attractions”–“chemical affinities” and actualised the mathematical atomism of Boscovich, according to which the elementary texture of matter could be causally explained within this complex architecture of mathematical “punkta”. In this tradition also coexisted, in a discursive synthesis, the “chemical element” of Lavoisier and the arguments of the new theory and its opposition to the phlogiston theory, but the “chemical affinities” were under the realm of the “physical element” as “metaphysical point”.